Students have been one of the worst affected sections in the country under the current regime, a group of left student’ organisations said while announcing their plans for protests here today. After the protest marches of workers and farmers, the national capital will witness the students hitting the streets on February 18 and 19 under the slogan ‘Save Education, Save Democracy, Save Nation’. The student organisations are demanding to establish a nation-wide fully state-funded and free common education system from kindergarten to postgraduate level and increase government spending on education. The funds for public institutions have been cut drastically over the years and the premier public funded institutions such as JNU have even stopped subscribing important academic journals by citing the scarcity of fund, a statement from the student bodies said. “The central government has given green signal to start Self-financing courses in public universities and colleges, in the name of autonomy. On the one side seats have been reduced in higher education institutions while on the other there is a complete dismantling of reservation,” it added. “The federal character of Indian education is under severe attack, with initiating central policies without taking the peculiarities of each state and their representation in decision making into cognizance,” they said. According to the organisers, students will be mobilised from across the nation for a massive student march to parliament on February 18. “There will be an intensive campaign throughout the country highlighting the issues of education as part of this ‘Delhi Chalo’ call by the left student organisations. Conventions and seminars will be held in all states rallying all democratic and secular sections,” the statement said. – Establish a nation-wide fully state-funded and free Common Education System from KG to PG. – Increase government spending to at least 6% of the GDP and 10% of the central budget on education. – Enact Bhagat Singh National Employment Guarantee Act (BNEGA) to ensure guaranteed employment to all. 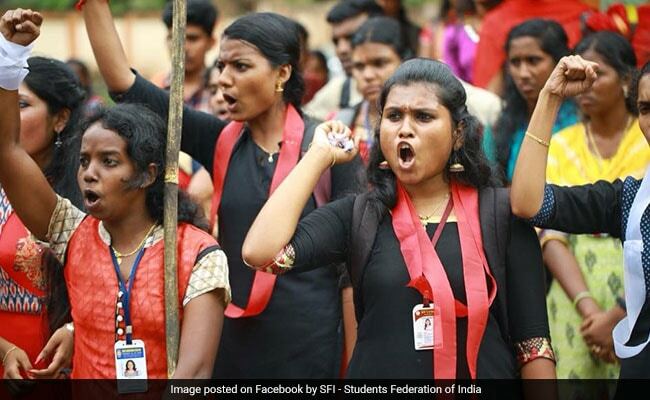 – Stop communalization of education. – Implement existing reservations properly and ensure social justice in govt as well as private institutions. – Release the money for all pending scholarships immediately and establish more fellowships for research scholars from deprived backgrounds. – Protect federal character of education and resist centralization of education. The protests have been planned under the banner of student bodies; SFI, AISF, AIDSO, AISB and PSU.